The 27th of April is now a momentous day in my otherwise uneventful life calendar, for it was this day one year ago that I arrived in Berlin, Germany. The year has been an adventurous and exciting one where I have achieved a lot. FOr all or you who religiously read my blog I am not going to bore you and repeat myself. For those of you who are newbies, welcome! You can catch up on my story so far here and here, among various other posts on my blog. It is easy to conclude that over these past 12 months I have become a happier person and I have achieved more than I could have hoped for in moving to Berlin. Except for one little thing. One annoying, horrible little thing that keeps gnawing away at me. I still cannot speak German! Ok, I guess I am not totally German free in that I can speak a few words and I can read restaurant menus (the most important thing I may add). But alas, I cannot string these words into logical sentences and neither can I provide a logical response to the most simplest of questions. I am not going to blame myself though. Oh no! I can’t anyway because I already promised you lot I would only be channeling positive thoughts and I wouldn’t want to disappoint you now would I? I blame the language. Maybe not an entirely feasible reason as to why I am linguistically inept in German but read along and you will see why there is some justification in blaming the language. PS: I did a Google search on my reasons and you will see I am not the only one in life who feels like this. 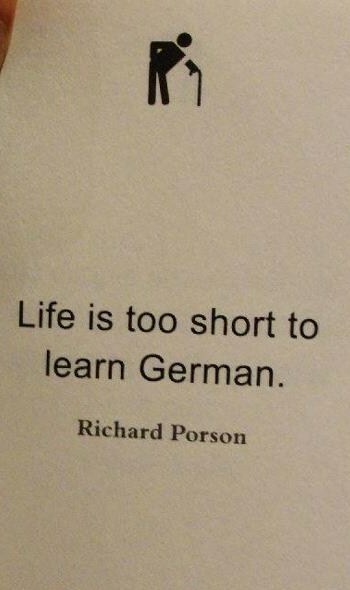 Reason 1: German is the hardest language in the whole wide world. Fact. My main reason for this is my good friend/forever enemy der, die, das. Coming in to the world of German as an English speaker, I cannot grasp how words can be masculine or feminine for no good reason other than to annoy the hell out of me. I know that other languages have such rules but why, pray do tell me, did the Germans feel the need to also have neutral words. Again, I believe it is solely to make my life that tiny bit harder. Reason 2: Nobody will speak German to me. I work in an international company who has English as its working language. This is a blessing but also a curse considering I spend 40 hours of my week in here with no initiative to speak the language whatsoever. Even when I have to call up German clients I simply use my favourite line ‘Sprechen Sie English’. I have no German friends – they are a hard bunch to crack. When I go into a shop and try to speak the pathetic bit of German I have, they immediately detect my inability and speak English to me. Come on guys, help me out here! I am in your country, please let me mutter the few phrases I have! Reason 3: The best reason in my opinion. So good in fact I have decided to visually show you rather than use words. Hope you all enjoyed this post and any tips you have are very welcome. I am taking classes by the way, I am just a German language idiot! Haha, i came here by chance because i read an excerpt of your blog regarding the Deutsche language. I am also a newbie German speaker. Thanks a lot! I am glad you enjoyed it. Good luck with learning German. I hope you will be more successful than me.